Early this morning, Robert Parker took a break from several weeks of traveling to post an update for his readers. Here are the wines as I recall them off the top of my head (forgive me if I get some of the wine details wrong): Chappellet 2012 Chenin Blanc (dilute, lacking perfume, simple, thin and abrubt); Abrente 2012 Carneros Albariño (neutral aroma, flavorless without vibrancy and texture…I wondered if they had actually planted Albariño); Massican 2012 White Wine Blend (a blend of mainly Ribolla Gialla with smaller proportions of Tocai Friuliano & Chardonnay. It was vaguely interesting for uniqueness-sake but not particularly exciting as a wine…fairly simple, tart and nondescript); a Pinot Grigio (can’t remember the name) with some residual sugar to give it texture and the illusion of fruit flavor…enough said. ; Heitz Grignolino (this was touted as a red wine but looked like a rose and tasted something like an average quality Gamay); a really disappointing Cabernet Franc (again, I’ve forgotten the producer but I was truly disappointed with this austere, astringent, weedy example because I know Napa can produce great Cab Franc when it’s matched to a compatible site), Lagier Meredith 2011 Syrah (The wine of the tasting for me – a pleasant, cooler vintage style with a medium body and plenty of pepper and spice.) I seem to remember we finished with an under-ripe, hollow, hard, acidic and forgettable Cabernet Sauvignon that wasn’t even close to Napa greatness standards. The whites were mediocre at best. Most were tart, hollow and under-ripe; one needed RS to keep it palatable. Eric Asimov even commented that one was not profound and quaffable… Nothing wrong with that, but the idea that that’s what Napa should strive towards is ridiculous. Reds were better (one weird, odd ball blend was a no go), with the 2011 Lagier Meredith Syrah showing well, but it’s far from their best vintage. Disappointing as a whole and I can’t imagine anyone left there thinking this is the direction Napa should be going. I’m not sure where Perrotti-Brown had a Cabernet Franc or Pinot Grigio, but it wasn’t in that room. And I’m shocked that Dunnuck found the “weird, odd ball blend” so disappointing – it received a score of 94-96 in the May 2013 edition of the Wine Advocate. I’d bet the bank that most attendees felt it was one of the strongest panels of the week. It was certainly where we had the most interesting wines. And the discussion was fantastic. Jon and Eric talked at length about the history of the California wine industry – walking attendees through where California’s been, where it is, and where they think it’s going. Smells a bit fishy. Defensive and dismissive, almost petty. As though anything JB liked, the RP crowd was determined and obligated not to like. And since when is Cathy Corison someone who is heading in the wrong direction. Makes no sense. Good post! LPB’s inattention to detail here is stunning. Is she really an MW? And the head of the WA? Whoah. And Jeb Dunnuck comes off as nothing more than Parker’s mini-me, which is all he is, anyway. What a couple of lightweights. If these are the types who are guiding the Wine Advocate forward then we are in for much hilarity. It almost seems as if the WA reps didn’t taste these wines. I might not be following everything well but they seem to have tasted a Pinot Grigio, a Cab Franc, and an odd-ball red blend that i don’t see listed in the wines you present as the actual line-up. Does anyone know for sure that they actually participated in the tasting? What the hell is going on here? It’s like high school and absolute nonsense that we don’t need in our lives. These WA folks are crazy and afraid. We shouldn’t dignify their work with the free press we’re giving them but at the end of the day attacks like these, as sad, pathetic and petty as they may be, do need to be refuted. Thanks for all the detailed information. It is at bare minimum incredibly entertaining to watch people go up in flames like this! Which “odd ball blend” received a 94-96 in the 5/13 issue of the Wine Advocate? Every critic is entitled to express his or her opinion. Accuracy, however, is not optional. Mike: The only “odd ball blend” poured among the reds was the Turley Library Vineyard Petite Syrah (12+ grapes, I believe). the WA team is threatened. weakening market share, and weakening influence is leading them to do the only thing they know how; launch into vitriolic attacks against those that hold differing view points. what i never understood about the whole WA’s culture is their insistence that there is a right or wrong way of interpreting wine styles. Say what?!! Maybe they gave Lisa different wines than the ones the rest of us tasted. I thought the wines were interesting and well made, and didn’t hear anyone around me complaining about them. I was not at this tasting. Two of these wines I have written praise of. So don’t kill the messenger. Three different writers who WERE at the tasting expressed views similar to Parker’s when I saw them two days later at Premiere Napa Valley. I was not soliciting such conversation. In fact, I was gathering quotes about Premiere Napa Valley, and didn’t need to slow down. There’s probably a blog post in whether the anti-Parker crowd is becoming conformist in its own way. But I don’t feel like writing it. At least not today. Amazing, but sadly unsurprising. Not everyone was enthralled with the tasting. I did hear a few comments from people who’ve grown tired of the “New California” shtick. But the misidentification of the wines, mostly off-the-mark descriptors and slapdash slamming of the tasting show not just an axe being ground but a lack of professionalism. Pretty tired of the agenda on both sides – I’d rather listen to fencing at his point. Winemakers, please just make wines you love in whatever style you’ve created after your long years of effort. Trends will come and go. Meg and Fred are exactly right. Even if you’re not a “New California Wine” fan, it’s still worth exploring Napa wines other than the standard Chardonnay and Cab. everyone is reacting to offhand comments not detailed tasting notes. A number of the producers have been very favorably reviewed by the WA (even Parker himself). I would suggest everyone familiarize themselves with the more obscure grapes. Even in their home in Italy they are mostly blended or represent a tiny production. They are even curiosities. (I would recommend Ronchi Di Ciallabianco Ribolla–not inexpensive!). The point being there’s a reason even the Italians don’t make a lot of wine from these grapes. I haven’t tasted one recently but my bet is California is not touching the French versions (yet?). The scores for their red wines and chardonnays from Parker are impressive. A chenin? Maybe they made a great one in 2012-but seriously folks..
Parker himself gave that 2012 97 points! (by the way–Parker has reviewed the producer very favorably!). it’s Bedrock for those who don’t know. Lots of praise for them from Parker. But it is hard to see the point here–it seems like there are hundreds of Albarinos from Spain alone. A little over reaction here, I think. I was wondering how long it would take for Parker’s lapdog, Mr. Lahart to appear. It was bound to happen and only a question of when. That’s one thing you can count on. I attended the tasting in question as part of the Wine Writers Symposium. While I do not taste and review wines in print, it was interesting for this self-professed Cabernet, Pinot and Chardonnay fan to taste some other varietals. While I enjoyed the Chenin Blanc and the Corison Cab, the rest were interesting to try but I won’t be buying them. That doesn’t mean they were inferior wines; just not in my wheelhouse. While I don’t share Jon and Eric’s passion for new California wines, I defend their right to advocate them. We can each form our own opinion. As for Parker, sounds like he is on a mission which I won’t get caught up in it. Pass the wine. Does a buzzer go off at your desk anytime that someone, somewhere criticizes the Wine Advocate? Do you get paid by the hour to clean up after them? 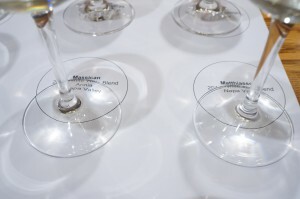 I am surprised that an MW cannot remember the wines at the event. She just drank them two weeks ago…went online and poo poo’d them and cannot remember much about them, never mind the names of the wineries or the grape varietals. Quite astonishing. Heck, Parker has not forgotten a taste, smell or label in 40 years…except when he tastes blind. Among the other points apparently lost on the WA staff were that, for the most part, these are not wines that are suddenly being made by hipsters or anti-Parkerians. On the contrary, these are varieties—and even specific wines in some cases—that were popular in Napa before Cab became king and before Parker became emperor. The tasting was as much as history lesson as anything else. As usual lots of snide comments and not one actually addressing anything. Actually David few people–even in Italy have tasted Grignolino or Ribolla. look em up–see what the Oxford or Oz Clarke say about them. In the 80′s it was often found in jug wines. We had more planted than France. There’s a reason it has given way to other white grapes here. I guess Blake and those three writers he cites are also Parker lap dogs! “A pale but not hugely interesting red grape…..the wine itself is made and mainly drunk locally. By the way–I have actually had a few decent examples. A lot of these wines are not really that interesting. They are being oversold and hyped. But there’s only room for one Big Dog lapdog. Something to be proud of! Chenin Blanc, from Napa Valley, today is quite unexpected. How many producers are there? If those wines were thin, then so am I. For those in the DC area you can buy the 2012 Vini Bocchino, Grignolino d’Asti. It is a red wine but the color is rather light. Its an interesting wine perhaps best drunk before other reds. It would be interesting to try a Californian version. I likely have the minority opinion here First, several of the wines included (Turley, Corison, Abrente) are among those I have reviewed well. Chappellet Chenin Blanc is a benchmark wine that is back after gone for a number of years (why else grow it on Pritchard Hill?) while at the same time liking many wines about as well as TWA has rated highly. So to me, as a writer, I realize there is no ‘right’ answer. I do however think that someone who is writing about wine should pay closer attention to what is front of them but having said that, none of these wines represent “Unexpected Napa Valley” to me with Heitz (’68), Chappellet (’72), Corison (’87), Turley (’93). Put me in the column of “Tired of the New California drumbeat”. Like I said, I find good things in and out of that arena. People shouldn’t think they need to be in or out of a particular camp. John – You defend Parker by stating he was only passing on hearsay? Hearsay from two people who had trouble remembering what was tasted or even knowing what was tasted? Then, you offer as evidence WA ratings that are much better than the impression he portrayed. Heitz has been making Grignolino for decades. Red, rose and port. It is, as Oz Clarke put it “quite attractive though curious.” It’s very distinctive and unique. A real passion for Heitz, which is why they make it, not an easy sell. I guarantee it’s not for everyone, but it is nothing like a run-of-the-mill Gamay. For Lisa to approach such a curious wine and not even give it a chance – I mean, her comment sounds like she skipped smelling. Maybe a quick sip and spit with a fatigued palate? Whatever the case, she did not describe, or even mention, the very prominent floral character. How is that competent? How is the emperor of wine forwarding his understanding of other people’s impressions professional in any way? What it does is fit with his long running narrative. The reality of those wines doesn’t matter. This is all pretty ridonculous. Maybe Bob Parker has been *rating* wine for so long that he has forgotten the power of words. To call this intended-to-educate tasting of a handful of wines “a disaster of showcasing largely emaciated, excessively acidic, hollow wines” and then lead that into positing that “many” attendees, left “wondering how wine writing could intentionally go down such a losing path,” well I am kind of “Whoa, dude, really?” And then to think that Parker was not even in the room and wrote that based on comments from TWA colleagues, now we are talking truly specious stuff. Granted, I did not read the original context of his comments, but there is not much wiggle room there when such definitively negative words are chosen. I was at the tasting. Loved some of the wines, did not like others. But, again, that was not and is not the point. I also do not know the entire context of Lisa Perrotti Brown’s followup comments, quoted above as well. But geez, if readers of my magazine were asking for followup, I think I would have at least checked the wines before responding at all. As Meg Maker commented above, accuracy is not optional. And even when writing in the comfy confines behind the TWA payrooll, to treat a peer-led tasting with such dismissiveness strikes me as unprofessional. Let’s be clear also on the scope of that tasting. It was 8 Napa Valley wines. That is not a sampling from which any respected wine writer can or should pass sweeping judgment. Are TWA writers incapable of tasting and discussing wines without feeling the need to pass judgment? One wonders if this was really just a post-symposium drive-by character assault… or perhaps it was just the inevitable fallout from holier-than-thou wine raters who may well have passed their judgment before it began, based on the presenters? I hope that is not the case, but from the excerpts above, the language is pretty darn damning in my view. Let’s not bury the lede here, people: “forgive me if I get some of the wine details wrong”? It’s unacceptable to be so cavalier about facts. Whether you like 11.5% Ribolla Gialla or 14.5% oak-soaked Chard, you need to be on the side of accurate information. Grignolino, whether from Heitz, or any other Napa producer, has to be considered unexpected from the region. Chenin Blanc, with so little produced, same. Syrah, Petite Sirah and Cabernet…not so much…but they did seem to select 3 very good producers of those Grapes. Turley, Corison and Lagier Meredith. Whether you liked the wines or not, I think the selection met the theme. LPB not remembering what she drank, then using travel as an excuse as to why, AFTER she ripped wines that she had not consumed at this seminar, is just laughable. Tough to take her seriously. Unless, of course, you have never taken issue with the WA. Just make wines you like to drink. So tired of the “new vs old” or “ripe vs balanced” crap. Let’s talk about the dirt and all the hardworking people it takes to put a bottle in front of these critics. I had a beautiful Grignolino from Accornero in the Monferrato a few weeks ago. It is a wonderful wine and a great change of pace from the usual over the top, over ripe, slightly sweet reds from Cali I am tasting for work all the time. Yes, it is more rose colored than red, as it should be. If you can’t appreciate one you probably should not be a wine writer. I wasn’t one of the “three” writers who talked to Blake about the tasting, but I was there and I can say the people around me all agreed on one point, and it wasn’t about the wines: We all agreed Jon and Eric were revising history and basically accusing Napa of selling out, a point the group around me disagreed with. We were all disappointed we didn’t get a larger, fuller perspective, and yes, we were all pretty worn out by the argument that so much of what Napa does is wrong. What we were hoping to hear is that Napa, like the rest of California, does so much, which is a more genuine, and less argumentative perspective. And we wanted to hear about all of it, not only that Napa had crossed over to the dark side. I was one of the people who asked a question about their more narrow perspective, and heard from more than a dozen people after the session who agreed with my question. Jon and Eric get to love the wines they love, and to push them, but given their positions in the media and the industry, they are, as journalists everywhere argue, supposed to help us see the world whole. “I’m in Hong Kong this week so don’t have the wine list or my notes from the Bonne & Asimov “Unexpected Napa Valley” tasting at the Wine Writers Symposium, but here are the wines as I recall them off the top of my head (forgive me if I get some of the wine details wrong): Chappellet 2012 Chenin Blanc (dilute, lacking perfume, simple, thin and abrubt); Abrente 2012 Carneros Albariño (neutral aroma, flavorless without vibrancy and texture…I wondered if they had actually planted Albariño); Massican 2012 White Wine Blend (a blend of mainly Ribolla Gialla with smaller proportions of Tocai Friuliano & Chardonnay. It was vaguely interesting for uniqueness-sake but not particularly exciting as a wine…fairly simple, tart and nondescript); a Pinot Grigio (can’t remember the name) with some residual sugar to give it texture and the illusion of fruit flavor…enough said. ; Heitz Grignolino (this was touted as a red wine but looked like a rose and tasted something like an average quality Gamay); a really disappointing Cabernet Franc (again, I’ve forgotten the producer but I was truly disappointed with this austere, astringent, weedy example because I know Napa can produce great Cab Franc when it’s matched to a compatible site), Lagier Meredith 2011 Syrah (The wine of the tasting for me – a pleasant, cooler vintage style with a medium body and plenty of pepper and spice.) I seem to remember we finished with an under-ripe, hollow, hard, acidic and forgettable Cabernet Sauvignon that wasn’t even close to Napa greatness standards. Posted on eRobertParker.com Bulletin Board on 6th March 2014 at 10.40 p.m.
For the record, the disappointing Pinot Grigio and Cabernet Franc were tasted 2 hours after this Bonne and Asimov tasting at another tasting during lunch also titled, “Unexpected Napa Valley”. I’m not certain if the wines featured at this 2nd tasting were chosen by Jon Bonne and/or Eric Asimov but the tasting did carry the same title. To be clear, my comments were made in a social media (Bulletin Board) context (not a formal article) in a candid manner, which – like it or not – has become appropriate in the context of social media. But because social media necessitates an immediate response, I couldn’t very well wait 9 days until I returned to Singapore and my Napa Valley Symposium tasting notes to give a formal tasting note response to a direct question from a reader offering examples of what I felt were “specific failures” experienced at the tasting. My options were to ignore the direct question or answer spontaneously (openly and honestly stating the circumstances) on what my impressions were, which – like it or not – is largely for what social media is designed. I think I made it perfectly clear in both posts that my comments were not an attack on Jon Bonne or Eric Asimov. In fact the point in my original post that was edited by David White was this: “I think the point behind the tasting was a valid one and perhaps I went into it with my expectations a little too high. Bottom line is that their point wasn’t well illustrated with the wines we tasted.” As you can see from the full post above, I went on to explain that I felt that some of the wines we were shown seemed to be, by their lack of fully evolved flavor compounds and/or tannins, vine/terroir incompatible and were therefore not the best examples of these varieties nor Napa terroir. I was disappointed that neither Bonne nor Asimov mentioned terroir compatibility or terroir at all, although to their credit they did give interesting accounts of historical incidences of unusual variety plantings. I welcome and value everyone’s individual views on the particular wines. My impressions are just that and I accept and embrace that there are those who view the wines we sampled during the “Unexpected Napa Valley” tasting very differently. I firmly believe that differing views are what make the wine world exciting. Our differing views on the wines are not the point. The point is that I felt that Bonne and Asimov could have made that tasting so much more exciting (at least to me) by choosing some truly superlative wines from unexpected varieties that excel in selected unexpected Napa terroirs and if they’d come prepared to talk about those grapes succeeding in terroirs that defy preconceptions it would have knocked the presentation out of the park. But, once again, perhaps I went into the tasting with my expectations too high. Lisa: First, thank you for your comment. Hugely appreciated. Second, my apologies for the snarkiness of my tweet. I was referencing Robert Parker’s comment on eBob, where he wrote, “Asimov and Bonne… are alleged to be professional writers,” which I felt was quite out of line. That said, the snarkiness shouldn’t have been directed at you. As for the context, I was simply bringing attention to opinions on the wines served, which is why I left the other parts out. You will be a busy man if you point out every time wine writers have radically different opinions on wines. Accornero does make a great Grignolino. I visited the property a few years ago and enjoyed it a lot. But it was a little too expensive for me. Nevertheless, a solid wine. Perhaps, the WA should buy Monica Larner a btl to taste. She can give her viewpoint. LPB, your comment above is instructive and welcome. I only wish it had come earlier. As you point out: “…because social media necessitates an immediate response, I couldn’t very well wait 9 days until I returned to Singapore… My options were to ignore the direct question or answer spontaneously (openly and honestly stating the circumstances) on what my impressions were, which – like it or not – is largely for what social media is designed.” It is unfortunate, in retrospect, that you waited to put your full remarks in the comment section. Your points, in the context of note-less recollections, make total sense, and your opinion is certainly valid; after all, you were there too. In retrospect, however, perhaps the most important conclusion to draw from David’s original post and the comments that followed is simply that Robert Parker is in desperate need of editing. Paywall notwithstanding, by publishing his original comments on the “Unexpected Napa” seminar — which he did not attend — he comes across as reckless at best, vindictive and clueless at worst. Even a high school newspaper editor could have and would have flagged the fact that his remarks were based on hearsay — and thus were ill-advised. Does The Wine Advocate apply a different standard to online writing than print? Does nobody there care when their namesake leader makes incendiary comments about colleagues? I did receive a copy of his entire online post after the fact, replete with a reference to “Eric Asinov” (sic). Unlike yours, the complete context in no way lessened the dismissiveness. Moving forward, whether you like it or not, it should be fully expected that comments from Robert Parker (in print, online and spoken) himself will receive greater scrutiny than those of every other wine writer on the planet. His rants over the past several years — which are nearly always directed at nameless opposition forces — leave a cumulative impression of a critic who shoots from the hip and is hitting himself in the foot with alarming frequency.